I use the singular above because, although many HomePods will live in shared spaces throughout our houses, the iOS 11-like Quick Start process made it clear that it was essentially “my” HomePod. Tonya is, of course, welcome to use it, but it will take its cues for what music to play from my Apple Music collection, it will send texts from my Apple ID, and any reminders added via Siri will collect in my default Reminders list. Obviously, there are a few minor workarounds to this single-user limitation, such as creating a shared Reminders list (or using the Family Reminders list, if you’re using family sharing) and explicitly directing new tasks to that list, and I’m sure we’ll discover more as we go. 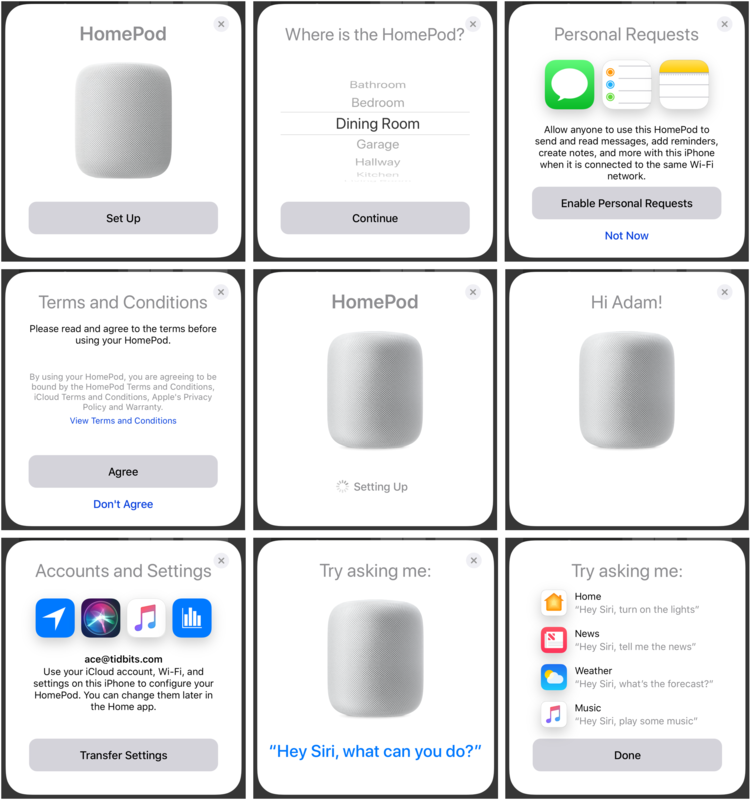 But my first impression is that Apple has punted on the technically difficult question of connecting multiple accounts to the HomePod so Tonya could send texts, add things to her Reminders lists, and access her Apple Music playlists and personalization. It’s worth noting that the HomePod can play only music from Apple Music, purchased from the iTunes Store, or stored in iCloud Music Library via iTunes Match. Notably, it can’t play tracks in your iTunes library via Home Sharing, at least on its own. That said, it works fine as an AirPlay speaker, so anything you can play on your Mac, iPhone, or iPad, you can stream to the HomePod. It would be nice to see Apple adding Home Sharing support in the future, though the company is clearly focusing its energy on paid cloud services. Audio Quality — Enough whining — the HomePod is a speaker, so on to the music! I’ll date myself here, since the first song Tonya and I played was “The Man’s Too Strong,” from the 1985 “Brothers in Arms,” by Dire Straits. That album was one of the first recorded on a Sony 24-track digital tape machine, and one of the first directed at the then-new CD market. Dire Straits sounded great, far better than an iPhone on its own or an iPhone in a Mangobeat amplifier (see “Mangobeat Amplifies iPhone Volume Naturally and Sustainably,” 9 December 2016 — sadly, it appears to be defunct). Our house, which dates from 1984, was built with speaker wires in the walls and a pair of Realistic bookshelf speakers mounted high up in the kitchen. In the living room, we’ve attached a pair of decent Mission speakers from 1990 to a somewhat newer Yamaha receiver, and it gets music via an AirPort Express over AirPlay. The HomePod sounds better than the Realistic speakers, which can’t compete on bass, but is pretty comparable to the much larger Mission speakers. Comparable, that is, except for the fact that the HomePod can’t do stereo. To be fair, the beam-forming tweeter array can provide some spatial separation, so while one HomePod can’t provide stereo, it doesn’t sound quite like a single speaker. The HomePod can fill a room with sound — it has plenty of power. In our house, where the first floor is largely open and roughly 24 by 48 feet (7 by 14 meters) with 8–10 foot (2.5–3m) ceilings, there’s no problem hearing the HomePod at 75 percent volume anywhere downstairs. At full volume, I measured the HomePod at about 80 decibels at 6 feet (2m) away — definitely louder than was comfortable. We generally run it between 15 and 40 percent. Happily, unlike our stereo system, which draws about 30 watts idle and 40 watts in use and thus makes us want to turn it on only when we’re using it, the HomePod sips power, taking roughly 4 to 7 watts when playing, 2.5 to 3 watts when it is resting but has been used recently, and 0 watts, occasionally spiking to 1.5 watts or so, when it has been alone in a quiet room for some time. I won’t pretend to be an audiophile, nor to be able to offer any objective advice about the HomePod’s sound. 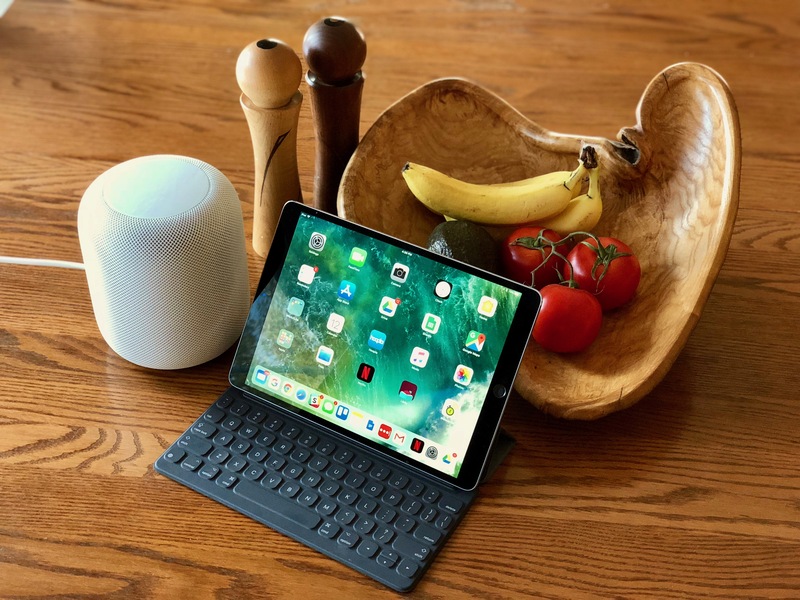 If you look elsewhere, you’ll find plenty of opinions — the musically involved Kirk McElhearn thinks the HomePod is overly bassy, perhaps due to its digital signal processing, which works well with some types of music, but less well with others. How the HomePod compares to any other speaker probably depends on room setup, connection/transmission technologies, and much more. True audiophiles have probably invested significant time, money, and effort into building stereo systems that sound much better. They might see the HomePod much like a pro photographer would see a point-and-shoot camera — a distinct step down in quality, but perfect for informal use. Younger, more mobile people might appreciate the HomePod’s quality because they’ve grown up with headphones and don’t have ungainly stereo systems. And those who have been struggling along for years with somewhat unsatisfactory audio systems might see the HomePod as the opportunity to leap into the modern era, particularly once Apple updates the HomePod’s software so two of them can work in stereo mode. That’s due later this year, along with support for multi-room audio. Speaker Smartness — Although you can stream music to the HomePod from an iOS device or Mac via AirPlay, and via the new controls Apple recently added (see “New Ways to Control Your Apple TV in iOS 11.2.5 and iTunes 12.7.3,” 2 February 2018), you’re most likely to control it directly via Siri. “Hey Siri, play some soft jazz,” and “Hey Siri, play the Yardbirds radio” work well, with Siri tapping Apple Music for a jazz playlist and pulling out tracks that are similar to the music of the Yardbirds. However, I often found myself somewhat at sea because I seldom think, “I’d like to listen to songs that are musically similar to the Yardbirds.” This may date me too, but I usually approach the idea of listening to music with an open mind, and only hit upon something to play after scanning a list of available albums or artists. Back in the day, that meant looking at a shelf of LPs or CDs, and now it’s a matter of looking through my Apple Music library. With Siri on the HomePod, that’s not possible, so you have to be specific, or bail entirely and say, “Hey Siri, play music I’ll like” to get your personal station in Apple Music. You can work around this by finding tracks on the iPhone or Mac and then sending the audio to the HomePod via the new controls. You can adjust the volume by asking Siri to change the volume by percentages — “Hey Siri, set the volume to 20 percent.” Other standard controls work via Siri too: pause, play, skip, and so on. You can even tell Siri to fast-forward or rewind some number of seconds. If you don’t want to ask Siri for help, just tap the volume buttons on the top of the HomePod, or between them to stop playing. Notably, the HomePod picks up your commands even if music was playing quite loud. We used a Google Home for a little while last year, and that was one of its problems — it couldn’t pick out commands that well when it was itself the source of a lot of sound. Siri on the HomePod can do some level of trivia, like how far it is from the Earth to Mars, or who wrote “Catcher in the Rye,” but organically, I’ve never had a real question that, when I posed it to the HomePod, it could answer satisfactorily. This was also true of the Google Home, when we had that, and various Amazon Echos I’ve interacted with in other people’s houses. So either I’m an outlier, or this use case is akin to being told that personal computers are great for keeping your recipes — nominally true, but not something people did much. I don’t have any HomeKit devices, so I wasn’t able to test the HomePod’s capability to control them via Siri. I presume that works — the commands are quite simple, and there’s no reason to assume it wouldn’t. Honestly, being able to control HomeKit switches and the like via Siri on the HomePod increases our interest in installing such automation a bit, though we could, of course, have done the same stuff through Siri on the Apple Watch. Hey Siri Priorities — Siri on the HomePod is always listening for the “Hey Siri” trigger, but you might have other Apple devices that are as well. I’m in the same room as the HomePod, typing on an iPad Pro, with my iPhone X next to me on the chair, and an Apple Watch Series 2 on my wrist. So which answers to “Hey Siri”? First, note that, usually, only one responds per owner (by Apple ID). That said, my iPad Pro and the iPhone X always wake up and show that they’re listening, before realizing that another device has priority. Which device gets priority is interesting. My iPhone X, when it’s unlocked, and the Apple Watch, when I’ve raised my wrist to look at it, share top priority, as the closest devices to me. In fact, if I give both attention at the same time, they’ll both respond to “Hey Siri,” and the HomePod will blithely continue playing music. However, if neither has my attention, the HomePod takes priority next, which means that it responds most of the time that I’m not actively looking at the iPhone X or Apple Watch. The iPad Pro is the odd man out, getting priority only if I’m not within range of the HomePod and neither of the other two devices has attention. That’s true even if I’m actively typing on the iPad. Of course, you can always force Siri to respond on a particular device by invoking it manually with a button press instead of “Hey Siri.” That approach becomes necessary for anyone who is not the primary HomePod user, since this priority scheme doesn’t work for them. If Tonya raises her wrist and says “Hey Siri” to her Apple Watch, both it and the HomePod respond. Not great. HomePod and Apple TV — You can send audio from your Apple TV to the HomePod. Set this on the Apple TV in Settings > Video and Audio > Audio Output, or, for a shortcut, press and hold the Play/Pause button on the Siri Remote while on the main Apple TV screen. Also, in many apps, you can switch to the HomePod while watching a show by swiping down to reveal audio controls. This is mostly useful if your HomePod is in the same room as the Apple TV. In my initial testing, I experienced a few audio dropouts right after starting a new program, but it settled down after a few seconds and the audio synced perfectly with the video. That perfect synchronization also happens if you play video on another device and send the audio to the HomePod via AirPlay, which isn’t entirely common among AirPlay receivers. When audio is playing through the HomePod, you can use “Hey Siri” to pause and play the Apple TV content, change volume, and even rewind and fast-forward X minutes. However, other things Siri on the Apple TV can do, like tell you who stars in a movie, still work only when you press and hold the Siri button on the Siri Remote. When you’re not playing audio on the HomePod through the Apple TV, you can control the HomePod normally via “Hey Siri” again. Activating the HomePod with “Hey Siri” disconnects the HomePod from the Apple TV, forcing you to reconnect via the Play/Pause button shortcut. There might be a way of using Siri on the Siri Remote to connect it, but my guesses at “Change audio output to HomePod” and “Change audio output to Dining Room” (the name of my HomePod) didn’t work. HomePod as Speakerphone — I almost forgot about the speakerphone capability of the HomePod — you can start a call on the iPhone and then tap the Audio button and select the HomePod to transfer the call to the HomePod. Honestly, this works brilliantly — the HomePod is unquestionably the best speakerphone I’ve ever used. Sound quality is fabulous, and it handles people moving around the room well. 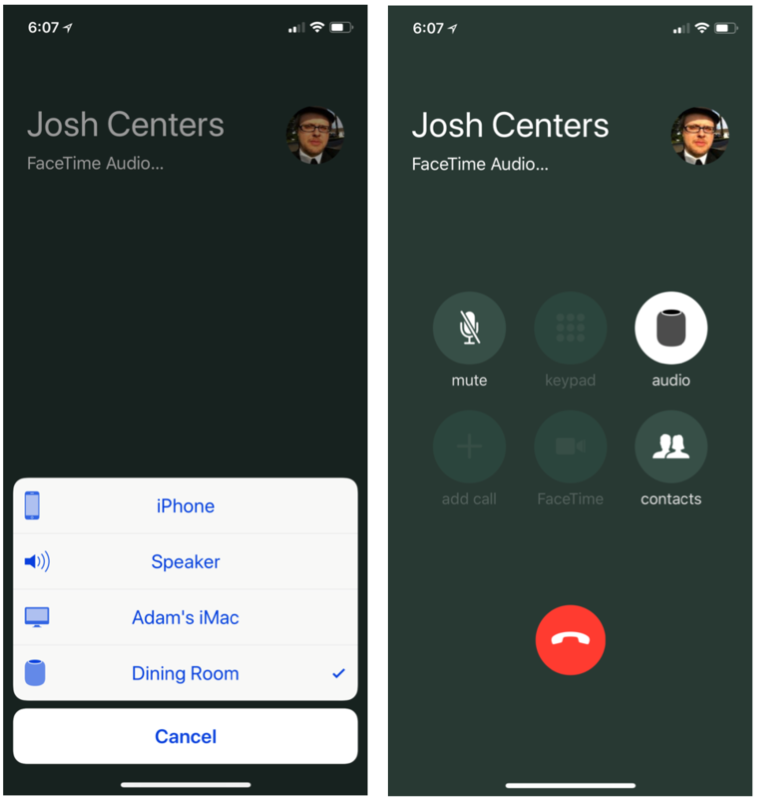 You can transfer calls made via the Phone app and FaceTime Audio, but not other voice-over-IP apps like Skype, Google Hangouts, and Slack. It’s possible that Apple will provide an API to tap into the HomePod and updates to those apps will support it, which would be great. Unfortunately, you can’t ask Siri on the HomePod to make calls, which seems a shame. Perhaps Apple will add this capability in the future — it doesn’t seem like it should be that hard for the HomePod to do Wi-Fi calling, as can the Mac and iPad, or even just control its paired iPhone to place the call. The Competitive Landscape — Right now, the HomePod occupies a somewhat uncomfortable space at $349. Amazon now has six Echo products: the Echo Dot for $39.99, the Echo for $84.99, the Echo Plus for $149.99, the small-screen Echo Spot for $119.99, the larger-screen Echo Show for $179.99, and the camera-laden Echo Look for $199.99. Over at Google, the Google Home Mini costs just $39 right now, the mid-range Google Home is $99, and the Google Home Max (probably the most comparable in terms of audio quality) is $399. Why would anyone buy a HomePod over one of the more mature and radically cheaper devices from Amazon or Google? Audio quality, perhaps, but the big one is complete integration with the Apple ecosystem. The Amazon and Google devices won’t work with Apple Music, just Spotify, so if you don’t have a Spotify account, the HomePod gets a lot more attractive right off. (Conversely, if you do use Spotify, the HomePod is a lot less interesting.) Having the HomePod appear as an audio output device for any iOS device or Apple TV is similarly a big deal. Similarly, if you want to use voice control to interact with your task lists, text messaging, and so on, you’ll need a HomePod. Support could be deeper — you can’t access calendars or contacts via the HomePod yet — but it’s a safe bet you’ll never be able to do that via competing devices that can’t access iCloud. You might not be happy about this, but it’s entirely rational for Apple to force users into this choice because “Apple everywhere” is the path of least resistance for those with Macs, iPhones, and iPads. Apple has no incentive to help Spotify in any way, and that’s all that opening the HomePod up would do at this point. Even if Apple does decide to open the HomePod up to the wider world in the future, it’s more important for it to work well within the Apple ecosystem first. Apple’s greatest resource, in many ways, is its installed base. The fact that the company is making radically more money than ever before in its Services category (including Apple Music) and the Other category (which includes accessories like the AirPods and Apple Watch) shows that Apple thinks its best bet going forward is to entice current users into spending more on Apple services and accessories that will enhance their overall experience. The HomePod fits right into this strategy. Over on TidBITS Talk, I was reminded that I failed to say anything about the privacy differences between the Apple, Amazon, and Google products. I wrote this article entirely on Monday, and in truth, the privacy issue didn't flit across my consciousness since we set up the HomePod. That may be in part because I generally trust Apple with my data, but in reality I also trust Google and Amazon. I've used Gmail for many years with no negative experiences, and we've been ordering stuff from Amazon ever since we lived in Seattle and Amazon was small enough to qualify as "buying local." And, no matter how large and powerful these companies are, I think they all understand that they have to protect their users' data from exploitation by malicious actors. No company is invulnerable, and a massive privacy breach could be the first step down a path toward the sort of obscurity enjoyed by the likes of Alta Vista, MySpace, and Sun Microsystems. Or, more realistically, the highly lucrative but less dominant positions now held by companies like IBM and Microsoft. Regardless, if you're concerned about the privacy issues surrounding these devices, Apple is likely the "best," but you'd do well to read what Google and Amazon say in their privacy policies. It's worth noting that you can turn Siri off in the HomePod's settings in the Home app. You can also limit Siri to "touch and hold," so it won't listen when you don't invoke it. And the light comes on when Siri is listening, and you can also turn on a sound to alert you. This said, I still find it creepy. I don't leave Siri on on my devices. I'm not sure if I will do so with the HomePod. I'd like an easier way to turn it on and off, so, if I want to listen to music, I turn it on for a session, then maybe it stops listening a half hour after the last music has finished. Great review! I especially appreciate hearing your (and Tonya's) perspectives as members of a two-person household. Brothers in Arms?? One of my favourites. Rock on!! Federico Viticci of MacStories.net had one forwarded to Italy, and as far as I know, it's working okay for him. It's a little hard to imagine that Apple could (or would) prevent it from working, when it's planning to sell the HomePod in Canada in the future. What's weird is that Apple didn't include Canada to start. Agreed - very weird that Canada wasn't part of the initial launch. But then, we still don't have Apple's iOS News app, and it's been out since iOS9. Rumor is that it's gotten stuck on Trump's Wall (which we are NOT going to pay for). I can answer my own question. HomePod will *partly* work in Canada, but Apple has erected some nasty barriers to full functionality. If I try to create Reminders, Notes, or send Messages using Siri, she complains that the setting for Siri's language in HomePod and my iPhone have to be the same. She instructs me to change Siri's language on iPhone to English (United States). Siri's language in my iPhone is set to English (Canada), consistent with the iOS setting for Region. If I change it, the iPhone warns that I'll lose all the voice training that I've done since starting to use Siri years ago. I'll have to re-enable Siri and start training it/her again from scratch. The HomePod settings in the Home app reveals that the only languages HomePod presently handles are English (US), (UK), and (Australian). This HomePod limitation appears to impact services that require transcription of spoken text (i.e, Reminders, Messages, Notes). I've had no problems getting HomePod to understand spoken commands (setting timers, reciting the weather, playing music). Looks like we'll have to wait for Apple to officially release HomePod in Canada before full functionality is achieved. The Wirecutter is reporting that the HomePod can leave white rings on some wood furniture, so be careful where you put it. I have to tell you that this is the first review of the HomePod that comes across as completely unbiased. You Pointed out both the good and bad without the sense of any preconceived notions. I have looked at the insides of the HomePod on Apple's site and I must say from the viewpoint of both a Musician and a teacher of Physics I find it impressive. I have read many of the reviews and as you they all said great sound. Now that is subjective. In order to make a judgment I have to go to my local Apple Store and hear it for myself. I am really not that interested in the smart features. I can do those on my iPhone. I would really like someone to compare it to a quality bluetooth speaker such as the Harman Kardon Onyx . Now I have a Bose Sound link color (last year"s model) and I have to say it sounds pretty good and has gotten praise in every review for sound quality. I don't blast my music, so this has been fine. I can hear all the instruments distinctly. I think you can prevent the rings by just setting the HomePod on top of the circular package containing the paperwork associated with the HomePod (from the bottom of the box it came in). If you want something more elegant, drink coasters work. Michael Tsai is collecting links to a bunch of audio tests of the HomePod. How does it compare to Sonos One bundle of two speakers with Alexa for the price of one HomePod?